Yakiniku is often translated as "Korean Barbeque", although it's not really barbeque (usually being cooked indoors over charcoal or a gas flame) and, at least as served in Japan, is not truly Korean. It's not something I want to eat often, but when I do it's a craving that's hard to ignore. Recently I've really been craving it, and not being able to afford a visit to a yakiniku restaurant (good yakiniku is pricey) decided to do it at home. It's really easy to cook at home but we haven't done so in years as yakiniku at home has one major drawback: it creates a lot of heat and smoke, so can really only be done in the spring or fall, when it's warm enough to open all the windows but not so warm that the extra heat of the grill will make you sweat. From left: sanchu (lettuce used for wrapping cooked meat); kimchi (spicy pickled napa cabbage); kashira (pork cheek); a plate of three kinds of meat: kalbi (boneless beef rib, top), buta rosu (pork shoulder, left), and gyu momo (beef round, right); and namul (Korean style seasoned vegetables): zenmai (fern shoots, left), daikon and carrot (top) and mung bean sprouts (bottom). In the bottle and little dishes is yakiniku sauce. It's a lot of food, and lest you think us total gluttons let me assure you that we shopped with leftovers in mind, and didn't actually eat everything shown that night. 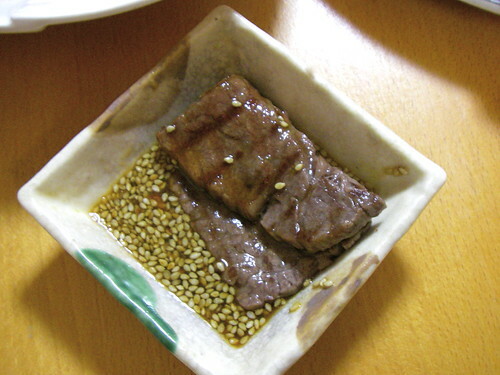 The sauce and namul were homemade but the kimchi is store-bought and all meat came sliced as shown and labeled yakiniku yo (for yakiniku), sliced at exactly the right thickness. Regular supermarkets sell convenient yakiniku sets with a few types of meat in the same package, but we had done the day's shopping at a discount market with no fancy sets but very very good prices. The pork was heavily discounted and the beef was half price, the only way we could afford good wagyu (Japanese top-grade beef). Eating yakiniku in a restaurant usually involves smaller portions and more cuts of meat, and a bigger emphasis on beef, but when you do it yourself it's hard to include everything. 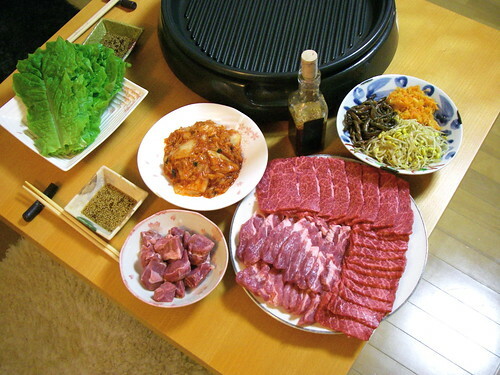 Yakiniku often includes vegetables, but with us they tend to get neglected in favour of the meat and end up burning. So this time we skipped them, figuring the sanchu, kimchi and namuru added enough healthiness. Here's a better look at the kalbi. The word kalbi comes from Korea, where it's actually pronounced galbi and usually served in long strips with the bone, requiring scissors be kept at the table to cut the strips down to size. 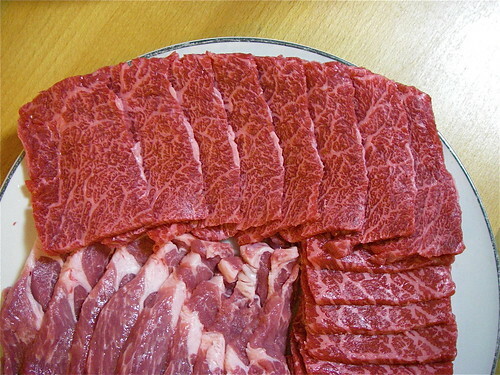 In Japan kalbi is a little more refined: it's nearly always boneless and pre-sliced and often from very good well marbled beef, like the meat above. This is shinshu-gyu a brand (yes, beef here has brands: think Kobe beef) from Nagano that is fed on apples. Here is the gyu momo, buta rosu and kashira cooking on the teppan (tabletop grill). And this is some grilled kalbi, dipped in the yakiniku sauce. Since everything is cooked little by little at the table yakiniku is always a leisurely meal, and we spent almost two hours on this meal. 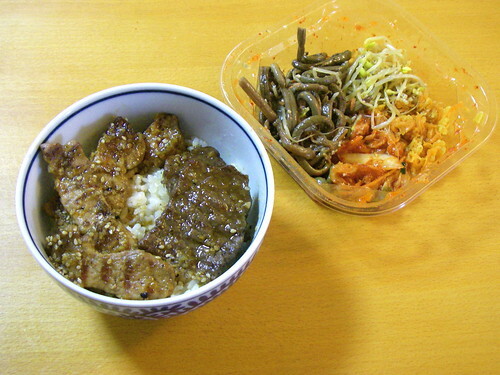 When we were finally stuffed we cooked the leftover meat and packed it away in the fridge, marinated in yakiniku sauce. And it made a very nice lunch a few days later, the meat reheated and served over hot rice and the namul (served in the tub that kimchi had come in) on the side. Oh gosh, that was stupid...I read this right before lunch. I've never even had yakiniku, but now you've passed the craving along to me. :O that looks super delicious! But just to note.. galbi is actually the korean word for "rib", hence rib meat (: sometimes it comes on the bone or off the bone. It really depends what kind you're looking for. Moonflow, I didn't know Koreans ate kalbi boneless too. It's always been on the bone when I've had it in Korean restaurants in North America. Thanks for the info. hello. i'm not good at english but i want u to know what was wrong. i guess Yakiniku means grilled meat in japanese. and Kalbi is a meat near the rib in korean. so mostly Kalbi has the bone in it. have you ever heard of Bulgogi? i think what u cooked is definitely Bulgogi. it's one of korean style barbeques like u posted. 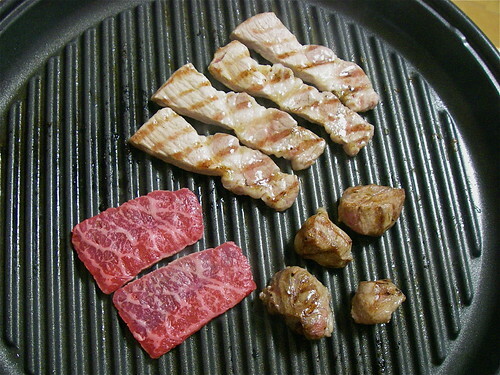 korean usually grill some meats indoor with that grill pan. and eat with sanchu, kimchi. so i guess u cooked Bulgogi. if u wanna know about that u could google it.. Yakiniku means just grilled meats in japanese as barbeque in english. so every grilled meat is called yakiniku in japanese. and you know those namul, sanchu and sanchu are korean. that is so korean style to wrap meats in sanchu for a very long time. it is also called Ssam in korea. Ssam is that putting some meats and other stuffs(depends on what u want to put in, for example there's a kimchi.) in vegetables(like a cabbage or a sanchu or a sesame leaf or whatever). if u pick to put some Kalbi in Ssam, that is Kalbi-Ssam. if u said Yakiniku as just a japanese word of barbeque, very acceptable. but a meat wrapped in sanchu is no, not a japanese style. all these stuffs (kimchi, namul, sanchu) are named korean and korean foods. wrapped meat in veges is also korean style. This looks amazing! I made a similar version after seeing this, but I had to use my Lodge cast iron griddle. It worked out pretty great!! Nice spread. I cook mainly Korean food, but I'm dabbling in Japanese cuisine (hence my visit here). Your dinner looks delicious. The only things I'd personally add are some raw sliced garlic, hot peppers and the ubiquitous spicy miso paste that I just can't do without when eating lettuce wraps. Though this would probably be very unacceptable by Japanese standards which, from what I've seen, seems to gravitate towards more delicate flavors. I'm thoroughly enjoying my visit to your site...beautiful photos.